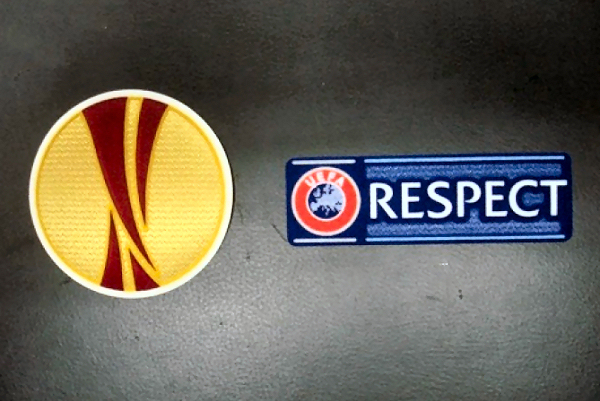 We were so looking forward to seeing City shirts adorned with Europa League sleeve patches, but sadly, the European adventure is over after just four games. That’s not to say those games were uninteresting to kit geeks, especially the play- off round games against KSC Lokeren of Belgium. Approval for the unique name and number font created by Sporting ID for City to use in UEFA organised competition came through in time for the first leg at the Daknamstadion, where Lokeren play their home games. The numbers feature the 2014 club crest at the base, and both numbers and letters are split in a stencil style. Is this in reference to Hull being a port? It recalls the stencils used to mark cargo boxes, and since City’s kits would be be shipped abroad for use in Europa League games, it seems somewhat fitting, whether by accident or design. City requested that Lokeren wear all black at home so The Tigers could give a debut to the white and blue third kit, that would act as first choice change kit in Europe. .
To comply with UEFA rules regarding kit supplier logos, the Umbro wordmarks on the shirt sleeves had to be removed. Most of them were, though the shirts of Harry Maguire and Tom Ince still had them (on one sleeve at least) throughout the game that ended 1-0 to Lokeren. For the home leg, the amber and black striped home shirts needed some modification. 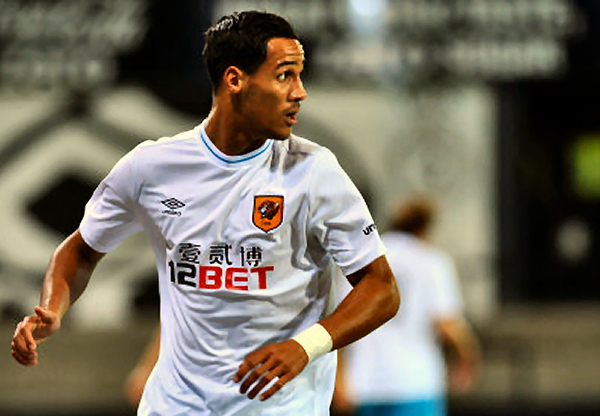 Whereas for FA sanctioned competitions, white numbers on amber and black stripes are considered to be of sufficient contrast, to satisfy UEFA stipulations, a plain coloured panel on the back is required. So Umbro created a new home shirt set, with plain amber back panels that stopped three quarters down, underneath which stripes resume. 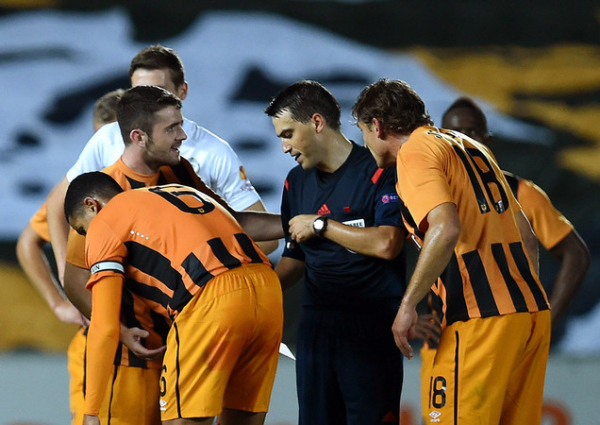 As at Lokeren, the Umbro sleeve text was again absent for the 2nd leg. Additionally, because Lokeren had agreed to wear all-black at home, they requested that we accommodate their desire to wear white shirts with black shorts in the 2nd leg, which meant a debut for the alternate amber shorts designed for use with the home shirt. The amber back panels on the shirts sure tweaked our loins as kit geeks, how we’d love to get our hands on a matchworn, though most City players swapped with Lokeren players. As for the amber shorts at home, we have recent form: We used amber alts when Southampton came to the KC Stadium in March 2012, bringing only black shorts. City had worn amber shorts at St, Mary’s earlier in the season so perhaps they thought that was part of our first choice kit. The use of amber shorts against Lokeren gave the occasion a special feel, we wouldn’t want to see it regularly, but it seemed somehow fitting for an extraordinary occasion. It’s just a shame City’s players couldn’t have put in a special performance to ensure progression to the group stage, City won 2-1 on the night but Lokeren’s away goal meant they went through on away goals with the aggregate score 2-2. We’d love to have seen the plain backed shirts used again, in conjunction with Europa League and Respect sleeve patches. I love the font used on the Europa kit. I went searching for photos of the Hull City Europa font since I first saw the Boyd jersey at Flickr. Too bad there are just not enough good photo’s available to complete a font. The videos at YouTube do not give you good look at the font. It is unfortunate that was only used on two matches. 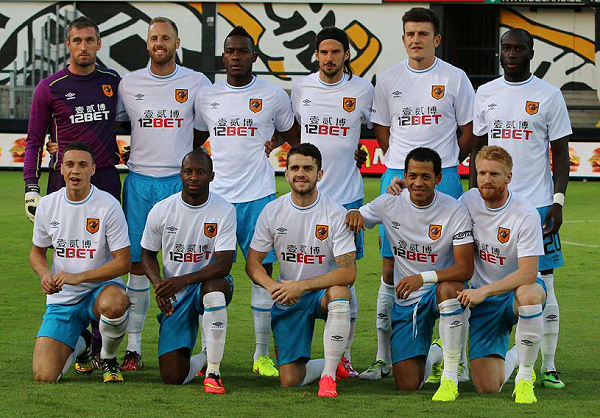 If only Hull City advanced, there will likely be more photos. I hope that Hull City will have another chance to use this font in the future. The font is just too pretty to be left unused. I really love that stencil font.